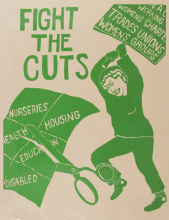 “Founders and later members of the British feminist poster collective, See Red Women’s Workshop (1974-1990) are involved with putting a book together about the posters and we are hoping to gather a collection of memories from women who were involved at some time (many women passed through the workshop), or who particularly remember the posters otherwise. If you are one of those women, do please get in touch with us. Or please forward to your friends and networks otherwise. Much appreciated! As would any ideas about other mailing lists to send this call round to. Thanks to See Red Women’s Workshop for allowing reproduction of their work under a Creative Commons license.